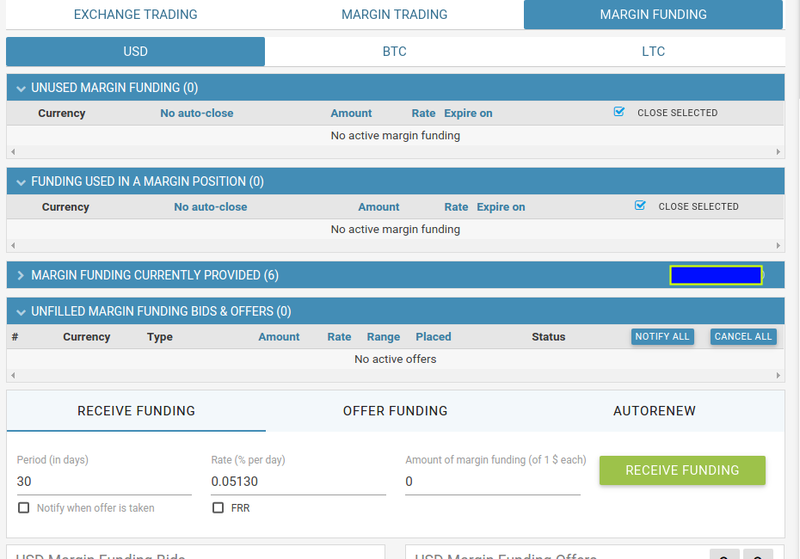 You can even earn interest on your bitcoin or USD by lending them to others to use as margin for their own positions. Perform traditional short-selling of bitcoin so you can profit when bitcoin price goes down! You can do trail stop orders, hidden orders, the features are endless. They're rolling out a Beta which has websocket support that makes the data streaming much more dynamic. The maximum leverage offered by Bitfinex is 3.3x, which is a moderate amount that allows you to get some extra out of your positions without putting you and your margin providers at risk. Sign up here and use Bitfinex Coupon Code FYuu9gSC9b to get 30-days FEE FREE trading there. So instead of keeping your USD or bitcoin on an exchange earning nothing, you can lend them out to people to use for margin positions. USD rates can net you sometimes up to 40% APY, while Bitcoin rates will be usually 2-4% APY depending on market conditions. Counterparty risk: The person you lend USD or BTC to has a position that goes so bust that their liquidation is at a loss. Exchange risk: Bitfinex gets hacked/scammed/embezzled and their funds don't cover your deposit with them. Now, we know BTC has no banks so we only get 0% return on our "deposits". As of now in 2015, rates in the US are still 0%, meaning USD deposits also get...a 0% return. Government bonds will also only get a 1% return depending on the timeframe. So earning 40% annual return by lending USD out to bitcoin traders is pretty attractive right now. It's worth noting also that Bitfinex has NEVER caused a lender to lose money from lending for margin traders, so they have many years now of a flawless record of servicing lenders well. Without lenders and the money they put out, Bitfinex knows that their platform is in trouble, so they make sure to treat swap providers very well. All these features exist also for Litecoin. They recently delisted "Dash" or "DARKCoin" because it's a pointless altcoin. Bitfinex is the most important USD exchange, period. If you need to quickly get bitcoins into USD deposits, you just open an account, deposit the coins, and can sell into the exchange without any need to verify your account. The only time you need to verify is when you actually deposit or withdraw fiat (USD).